Here at WhatShed, we love all kinds of sheds and we want to make sure that you are as prepare as possible before you pull the trigger on purchasing a plastic shed. We understand you may have a million questions and right down below we have the most commonly asked questions about plastic sheds. What Are The Best Plastic Sheds? Wow this first question is not messing around now is it? Of course this all depends on what you want the shed for, how much space you have and what your budget is. But if you take a look at our Best Plastic Sheds List you will find 20 of the best plastic sheds. You will also notice brands like Palram, Duramax, BillyOh, Keter and Lifetime who constantly make great plastic sheds. While we have a ton of plastic shed reviews here at WhatShed, we have made sure to put the top 20 all in one area so you can see what we consider to be the best of the best when it comes to plastic sheds. This is one of the most common questions and to be honest with you , we understand why. Plastic shed, just the name conjures up the image of something cheap. But the fact is most plastic sheds are anything but and are made from polycarbonate which is strong, lightweight and it also requires very little upkeep. Some plastic sheds will have a floor made from the same kind of polycarbonate as the walls and roof, whereas others will not come with a floor. Plastic sheds tend to snap together easily or are supported with a frame, usually made from aluminium. The Palram Skylight 6 x 12 Amber Plastic Shed is a great example of a plastic shed that is supported with an aluminium frame. So while sheds in this style are referred to as “plastic shed” do not think of them as being made with cheap plastic. What Are Plastic Sheds Like? Due to the way plastic sheds are manufactured, many of them have a certain kind of style to them. For example Palram have their own kind of style which has something of a workshop kind of vibe. Keter tend to go for a white/creamy kind of style and the other plastic shed manufactures each have their own kind of vibe. We feel that a plastic shed is a great alternative to a wooden or a metal shed and they will provide you with long lasting and low maintenance storage. We have looked at all the major plastic shed retailers here at WhatShed and the most common and well respected brands that we have come across are. Keter, Palram, Life Time, Waltons, GrosFillex, Duramax, Shed Plus and Suncast. Some of these only make plastic sheds, whereas other dabble in a little bit of everything. You can put one of these brands in our search engine or you can go right to our, plastic sheds section and see all of them together. How To Paint Plastic Shed? You don’t! That is the quick and easy answer. Here at WhatShed, we have yet to come across a single plastic shed that requires or even suggests that you paint it. Not having to treat or even give a fresh lick of paint is a huge bonus of having a plastic shed. How To Build Plastic Sheds? Installing a plastic shed is much easier than a wooden shed. If you look at just a few reviews from our plastic sheds section, you will notice that we mention time and time again how easy it is to install a plastic shed. Most of these snap together very easily and require very little DIY skills to do so. Even those that have a solid frame are easy to put together. It is advised that you have a friend to help you, but we do not see anyone having any problems building a plastic shed. Plastic sheds are very sturdy, for example if you look at our, Palram brand review you will see we mention time and time again how sturdy their sheds are. Most plastic sheds are built to last and many people we have spoken to have said the first thing that they notice about a plastic shed is how strong it feels. Some plastic sheds will snap together without a frame and these are strong, but others use an aluminium frame which gives them a real strong backbone and makes them just as strong as any other kind of shed. How To Clean Plastic Sheds? Cleaning a plastic shed is very, very easy. As a matter of fact being so easy to maintain is a major reason as to why more and more people are looking to purchase a plastic shed. Cleaning a plastic shed is as easy as turning the garden hose on it. Of course you can get the bucket and the sponge out if you really want to get in every nook and cranny. But for the most part, cleaning a plastic shed is very easy and hassle free. How Durable Are Plastic Sheds? If you look at our best plastic sheds list. You will see that one of the thing all the plastic sheds on the list have in common (as well as being made from plastic) is how durable they are. Plastic sheds are made to be strong and last for many years. Strong polycarbonate and in some cases an aluminium frame make for a very strong structure. You also do not have to worry about the plastic becoming weak as the years go by, which can happen to wooden sheds if you do not maintain them properly. How Much Are Plastic Sheds? Plastic Sheds are most commonly in the £200 – £500 price range. 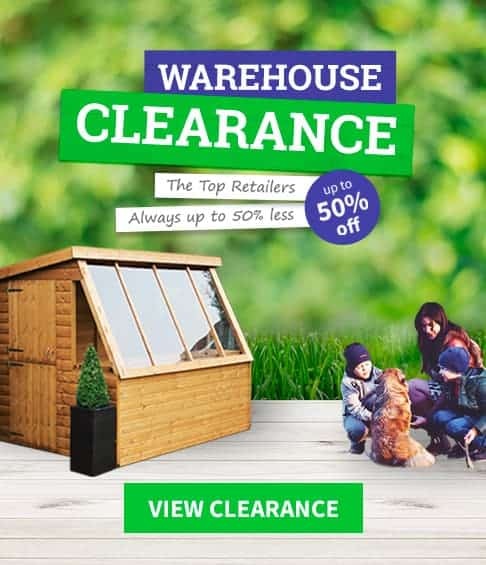 There are a couple cheaper than this, but for a decent sized shed, you are looking at around £200 – 400 with a few creeping up close to £500. There are of course a few more expensive ones and a plastic shed may seem like it costs more than a wooden one of a similar size. But when you consider how easier it is to install and the low maintenance of it. Paying a little extra starts to seem like a good idea. Just be sure to have a good look at our plastic shed reviews so you can find the right plastic shed which fits both your needs and your budget. How Secure Are Plastic Sheds? Plastic sheds for the most part will keep your belongings very safe from whatever mother nature throws at them. But when it comes to security against thieves. Most plastic sheds do not come with an outdoor lock. Ones such as the 10′ x 8′ Duramax Woodside Plastic Shed have a fantastic internal locking mechanism and a door handle that would make it easy to add a chain and padlock if you wish. So if you do plan on keeping expensive things in your plastic shed. Make sure you have a good look at our reviews so you can see which ones either have a lock or can have one easily added. How Good Are Plastic Sheds? The fact that we were able to make a top 20 plastic sheds list and not just a top 10 shows you that there are plenty of good plastic sheds out there. We love plastic sheds and feel that they are a great alternative to a wooden or a metal shed. They have a much more modern look than what you get with a wooden or metal shed. They will last for many years and you also do not have to worry about rot or rust ever appearing. We think that plastic sheds are great and have noticed that more and more people are looking at plastic sheds. How Long Do Plastic Sheds Last? In most cases you are easily looking at least 20 years or even a lifetime of use out of a plastic shed if you do not abuse it of course. If you look at three different plastic sheds such as one from Lifetime, Suncast, and Palram. You will notice that one of the common themes is a ten year warranty. Getting a warranty this long is always a good sign as it lets you know that the manufacturer is confident in their product. With a plastic shed, you do not have to worry about rust and rot, plus most of these sheds are made so that they do not discolour after being sat out in the sun for years. How Strong Are Plastic Sheds? Most plastic sheds are made from PVC and or polycarbonate panels. Now this may not sound strong, but this kind of material is incredible durable. A great example to show you just how strong a plastic shed is, is the 10′ x 18′ Duramax VDM Plastic Garage. This is an actual garage which while you can use for any kind of storage is made to house a car! So that lets you know just how strong a plastic shed really is. Most people who purchase a plastic shed are very surprised at how solid and robust it feels. This is quite a tricky question to answer, but it is one that does get asked. A plastic shed does everything a wooden shed does. They come in all kinds of sizes, there are plenty of different colours and designs and in all honesty. Here at WhatShed, we feel that no matter what your budget, size of garden or even your style is. You will find a plastic shed that suits your need. Why Are Plastic Sheds So Expensive? This is a question that does pop up quite a lot and yes a 6 x 8 plastic shed is most likely going to cost more than a wooden shed of the same size. But this is not to just pry more money out of your hands. A plastic shed has to be moulded and in general the reason a plastic shed costs more is simply because it costs more to make a plastic shed than a standard wooden shed. You have to consider the quality you are getting as well when you look at the price. So while it may at first glance seem a bit pricy. You know you are getting many years of use out of it and once installed, you are not going to have to do much to maintain it. Are Keter Plastic Sheds Any Good? Keter are one of the biggest companies when it comes to plastic sheds and we have reviewed many Keter plastic sheds. While if there is a shed, playhouse or other Keter garden structure you are interested in, we encourage you to look at the whole review. But if you just glance at the score, you will see that the majority of Keter plastic sheds and structures are 8-9 in their rating. The lowest rated Keter plastic shed is a 7.5 which really is still pretty good. So yes, Keter do make some great plastic sheds. This is a totally valid question and one that more than a few people have asked. While not so much damp, it is condensation that can be an issue with a plastic shed. This can be tricky to stop, but there are a few things you can do to help such as making sure you seal along the bottom of the shed along the inside and the outside and also by making sure that the plastic shed is built properly as well. Condensation is hard to stop, but by installing the shed properly and taking the proper precautions you can certainly help. Rats and mice can be very annoying and cause you to jump about 50 feet in the air when you see one! A plastic shed is no worse for allowing rats inside. A plastic shed actually will not have as many potential little cracks and nooks and crannies that mice and other little creatures can get in. But a preventing rodents from setting up a mouse hotel in your shed is really down to you by keeping food out of it and not leaving the door open all night! If you look closely at the plastic sheds we have reviewed, you can see from the pictures that plastic sheds are very tightly put together with no little areas for things to sneak in. The quick answer to this is going to be no. While plastic may not burn the same was as wood. Your plastic shed is still not going to be able to stand up to a fire. So not having a BBQ right next to it is a good idea. Plastic Sheds are very safe and in all the plastic sheds we have looked at, we can honestly say that safety is not a huge concern. Now some plastic sheds do not have proper locks on them, but this is something you can easily fix yourself with a padlock. But if you look at our Palram review, we do mention that these are very strong sheds and many of them do have a pad bolt to help you keep things safe. You will not have to worry about opening your plastic shed door and then a whole load of water coming out like you are in some kind of cartoon! In all seriousness, a plastic shed is great at keeping water out. Most plastic sheds if not all of them have an apex room so rain never sits on top and when put together properly there is no way for water to seep inside. Are Plastic Sheds Easy To Assemble? Ease of assembly is certainly a major reason why so many people are looking at a plastic shed over a wooden one. If you take a smaller sized plastic shed such as the Lifetime 7 x 4.5 Apex Plastic Shed, you can see from our review that it is very easy to assemble as the panels just click and snap together. Even something larger like the 10’5 x 13′ Duramax WoodBridge Plastic Shed is going to be fairly straight forward to install as once again it is mainly just snapping the pieces of cladding together. Are Plastic Sheds Better Than Wood? Here at WhatShed we love all sheds equally…. Ok that was vomit inducing so we will get off the fence just a little bit. We think that plastic sheds are great and a fantastic alternative to a wooden shed. They do not require as much maintenance, are easier to install and for the most part they have a more modern look than what you get with a wooden shed. We feel that a plastic shed is ideal for those who want their shed to be something that looks cool in their garden. Hi Linda, yes you can but it’s always better to have a stable base.